Since I chose "Honesty" as my word for the year I thought I might talk a little about honesty. Can you ever be too honest? I have been accused of this sometimes. If you ask me a question, I am usually going to answer you honestly, and sometimes the truth hurts. I need to learn to think before I speak...you would think after 60 years I would have learned this by now. and my answer is simple, I blog for myself as a way of self expression and recording my creative and family life. But if I dig a little further I also blog to show-off and get compliments. Honesty! I'm competitive and I like to get things done. I wish I was an innovator, but most of my life I have been happy following patterns and trends. This leads me to my latest copy along quilt along, the #scrappytripalong that has taken Instagram by storm. I have finally finished sewing all my squares for the quilt. I started with the idea of making 36, which would make a 6' square quilt, but today I decided I wanted it to be 6'X7', so I stitched up another 6 squares today. So my list this week includes sewing this quilt together and choosing a backing fabric (I'll need to order some fabric). I follow a lot of blogs and I try to comment a lot, but honestly, sometimes I would just rather read them and not comment. Another Honesty moment...it's ok if you don't comment on all my posts. I'm really ok with it. I have met so many wonderful people through blogging, and I have learned more than I ever knew existed about quilting. Tricks and techniques I would never have learned had I not discovered the amazingly talented, generous, funny and loving online quilting community. I love you guys! So Honesty...where do you stand? I blog so I have a record of my projects. I do like comments but I would blog even if I did not get any comments. I also like to show off my work. I am usually happy with what I produce. Your scrappytripalong is lookin' real good! Loved your post and I couldn't agree more. Your scrappy trip is looking good. I like your post here on honesty. :) My word last year was "intricate" I think I lived up to it. I haven't been able to come up with another suitable word this year... we'll see. I started blogging to meet other people all over the world, not being a quilter at the time, but I soon became one! I’m known for being outspoken (sometimes being too honoust, but that’s what we Dutchies often are). I love to receive comments and compliments too, yes. If you never would receive a comment on blogposts, I think I would call it a day! I'm for honesty with kindness. Ever heard of brutal honesty? Brutal honesty is destructive. Been on the receiving end of it too many times. I read but don't comment. Most of the time I'm on line at night, and my brain is way too tired to think of clever things to write! i used to worry what people would think, and maybe they wouldnt read my blog if i didnt comment on theirs. but this year i have decided to be more "honest" to myself, and bog and sew how i want to and stop worrying if its what other people are doing or expecting. so i didnt join in the scrappy quilt along with everyone else, much as I like it, because I have other priorities right now. 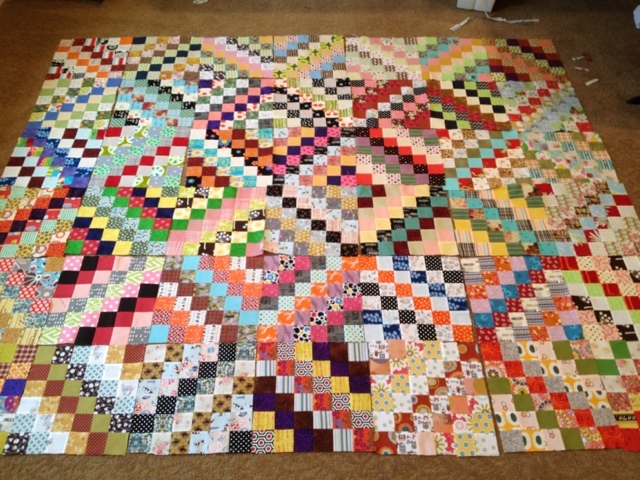 A scrap quilt is on the cards though for this year. Now I sound selfish don't I! I don't always comment, especially if I'm tired! I blog because I want to share my work; (I don't belong to any sewing groups, so I appreciate the feedback I get!) And having a blog has opened a whole new world to me! I rarely ever comment. I like comments but don't expect them. The ironic bit? I blog because I miss the quilting friendships I had before I moved to TN. Well that's why I started. I would still blog if I had "quilty friends". Think about freeing yourself from the obligation to comment unless you are so inclined. Great post, Di. I started blogging as a writing challenge and to show my family and friends what I was making. I fell in love with blogging when I found this wonderful, supportive community out there that does not exist for me where we currently live. Last year I went through a bit of a blogging crisis at the beginning of the year because it was brining me more stress than pleasure and I reassessed it all. I now blog because I genuinely enjoy it. I read blogs because there is a link there friendship wise, not just inspirationally, and I comment when I can. I reply to my comments as often as I can but if a busy life causes me to fall behind I no longer let it cause me anxiety. My family is more important. I also completely stopped obsessing about my stats. I used to be really bad for this. I think I now have a better balance, and I appreciate the great friends blogging has brought me, including you. I appreciated your post today. I loved your post today Di - and I think I probably blog for many of the same reasons, but for me it's also about meeting kindred spirits who 'get' what I am interested in too.....likeminded creators are pretty thin on the ground here! I know you didn't write this to make me laugh but I did have to chuckle a time or two. The older my mother (77 next month) and MIL (80) get, I joke that they lose their filters. They just say what everyone else is thinking. Then in a sobering moment I don't wonder if this isn't what we all should do - albeit to a considerate point. If I haven't told you before, I enjoy the mix of topics on your blog. Thank you for taking the time to write each and every entry. I blog to have a circle of friends interested in the same things as I am, which in real life is seriously lacking! I can be honest to a fault. There is a "tale" about an elderly woman who had dozens of friends and when asked the secret to maintaining friendships she said "I always taste the words before they come out of my mouth." I need to do more tasting (lol)! The reason I started blogging was to promote my art. I was selling on Ebay and people kept asking me if I had a blog. Then I got addicted to sharing information and things I found online. Now I blog to share about iPhone photography - my new passion. It's a way for me to meet like minded people and to feature people whose work I admire. I work in a world where honesty or truthfulness is an issue every day every hour. I blog for several reasons, one is to connect with people who quilt and craft as I do and some of them have become good friends, one is to be inspired and to learn, one is to keep a quilt journal - I have never been a journaling person so it is an experience and one is to get positive feedback and encouragement and/or suggestions. My blog is not meant to be a depiction of my whole life, it is just about quilting. I also read a lot of blogs and comment regularly on about 1/4 of them when I have time to comment at all. We all just do our best on that, I am sure.